My favorite childhood stories were about Winnie-the-Pooh and his friends. As my father read a chapter each night, it was clear to me that Christopher Robin deeply loved that silly bear. 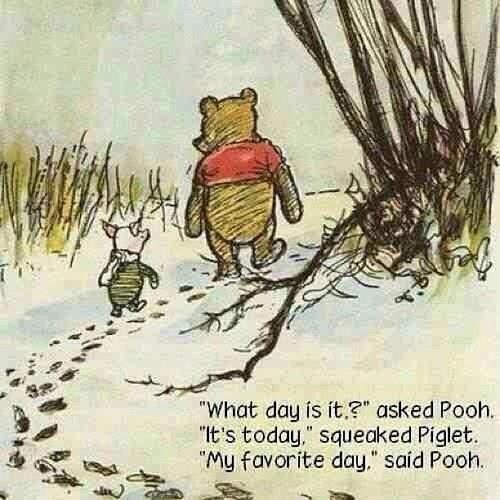 No matter what Pooh asked or did, a profound affection permeated Christopher’s words and actions in response. Though only a boy himself, he demonstrated the appropriate reactions and behaviors of a loving and caring parent. It was the friendship between Pooh and Piglet, however, which seemed most special to me. Theirs was a humble, clear, and honest relationship. No hidden agendas. No ulterior motives. No backstabbing. No competitiveness. Just a genuine joy and appreciation of being in each other’s company. Somehow, life was good simply because they experienced it together. This morning, I awoke as my husband got out of bed to let the dogs out. I wondered if he was going to head for the elliptical in the basement or come back to start getting ready for work. Much to my surprise, he returned and slipped under the covers to snuggle for a few minutes more. Ahhh, I thought, he remembered that I’m leaving for Israel today…. Yes, I’m going to Israel again. This is the sixth time in the past three years, thanks to the requirements of my job. (Not to mention my recent trip to Minsk, Belarus.) Fortunately, my husband is supportive of my business travel; he especially understands my love of a country that is as much my home as is Atlanta. But this time, I feel bad…even a bit guilty…that I’m leaving him. I’ll be gone for two full weeks; two weekends. I’ll be missing Valentine’s Day and the opening of the “Fifty Shades of Grey” movie. I know he’ll feel lonely and abandoned in our big, quiet and empty house. I know he will miss me. He kissed me goodbye and promised to be back in a few hours to take me to the airport. Not once did he complain about my late afternoon flight, the disruption of his day, or about my departure. My adult self still admires and aspires to the uncomplicated and straightforward relationship that Winnie-the-Pooh and Piglet have. After thirty-one years of marriage, my husband and I have a humble, clear, and honest relationship. No hidden agendas. No ulterior motives. No backstabbing. No competitiveness. Just a genuine joy and appreciation of being in each other’s company. Our life is good simply because we experience it together. We tackle the challenges and opportunities that come our way together in the best manner we can. But mostly, we do our best to make each day special. ← Now HE Wants Starbucks!